A few weeks ago I wrote about Jacqueline Soule’s new book Father Kino’s Herbs. 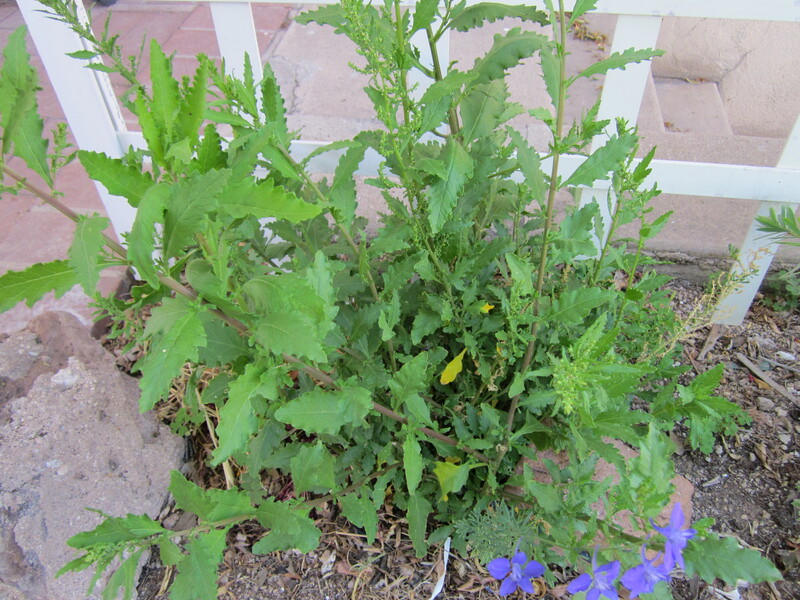 I was delighted to learn more about epazote (Chenopodium ambrosioides) because I had recently planted some in my yard. Unlike some of the other herbs Soule writes about, epazote originated in the New World. It was traded in the marketplace at Tenochitlan in Central Mexico as early as the 1530’s. Mexicans who made their way north to what is now Arizona brought epazote seeds with them and it was found in the gardens at San Xavier del Bac, a Kino mission outside of Tucson. The most widely known use for epazote is to cook it with a pot of beans. It not only gives black beans a special little zing of flavor, but it also helps break down hard-to-digest vegetable proteins and renders beans less gas-producing. Epazote can sometimes be found dried, but according to Soule, the dried herb carries the flavor but not the digestive benefits. If that’s what you seek, you’ll need a fresh plant in your yard or in a pot on your patio or balcony. Epazote is also used in green chile sauces and in dishes traditionally cooked in Yucatan and Veracruz. While it is an essential flavor component in some of these dishes, on its own it is bitter and medicinal tasting. In the United States, epazote is sometimes called American wormseed, Jesuit tea or Jerusalem oak — the latter probably because the shape of the leaf is a little like an oak. I used to grow this and sort of forgot about it. When my oldest child was young, I would steep it and then put into hot apple cider and we both thought it had a calming effect. Where can I buy seeds or the starter plants? Dena, I bought my plant from the Mexican woman who sells plants at the Thursday Farmer’s Market at the Mercado. Gretchen also listed some places, check her comment. I am thrilled to finally know what to do with all the epasote growing in the yard! Ranching friends in Northern Mexico tell of using epasote when livestock they stewarded had parasites. It is apparently quite effective with humans as well! Thanks, as usual, for expanding my Wild-Plant-Universe! I think I’ll throw some in with some teparies I am cooking today!